Prepared in 30 minutes or less plus 45 minutes to bake. Add lasagna noodles to a large pot of boiling salted water. Cook for 10 minutes, stirring occasionally. Drain and set aside. Bring the milk to simmer in a medium saucepan. Once heated, set aside. Melt 8 tablespoons of the butter in a large saucepan over medium heat. Add the flour and cook mixture over low heat for 1-2 minutes, continuosly whisking to prevent lumps. Pour all the heated milk into the flour and butter mixture. Stir in nutmeg, salt and ground white pepper and cook on medium-low heat for 3-5 minutes. Sauce should be thick enough to coat the back of the wooden spoon when done. Remove pan from heat and set aside. Heat olive oil and 2 tablespoons of butter in a large pan. Add half of the mushroom strips and sauté for 5 minutes. Add oil, if mushrooms become dry. Add remaining mushroom strips and toss while sautéing to cook evenly. Set mushrooms aside. Assemble the lasagna by spreading some of the white sauce in the bottom of an 8x12x2-inch baking dish. 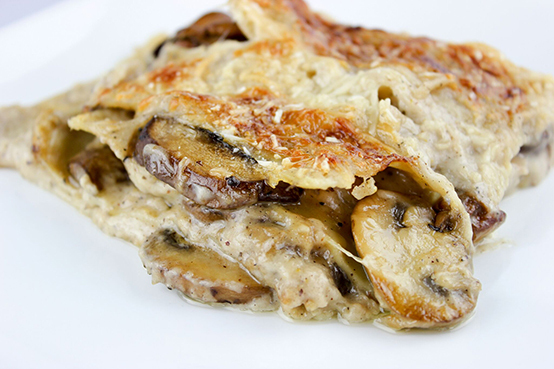 Arrange a layer of lasagna noodles on top, then a little more sauce, one-third of the mushrooms and one-quarter cup grated Parmigiano-Reggiano cheese. Repeat two more times following the layering order. Top with a final layer of noodles and white sauce and remaining grated cheese. Bake the lasagna for 45 minutes or until the top is lightly browned and sauce is bubbling hot. Remove from oven and allow to rest for 10 minutes. Serve hot. Serves 8.